Anticlastic Raising is a way of shaping metal, curving it into different directions like the shape of a horse’s saddle. The shapes obtained with this method are very organic and beautiful. 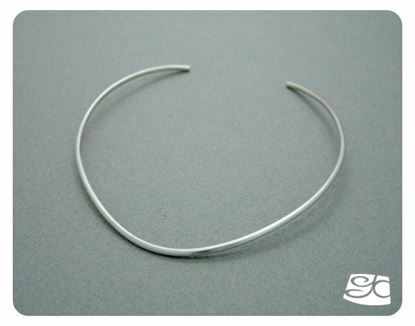 They are also very strong; this means that thinner gauge metal can be used to make lighter pieces. Our cuff will be shaped into an asymmetric anticlastic spiral. 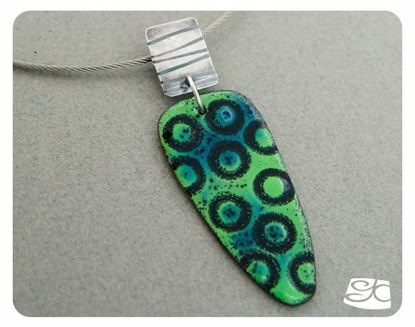 With one large lampwork wavy disk on the wide side, and a small disk in a contrasting color on the narrow side. The tutorial is an instant downloading PDF file, it has 8 pages, 16 photos, a life size template of all the components and plenty of tips! For intermediate skill students. 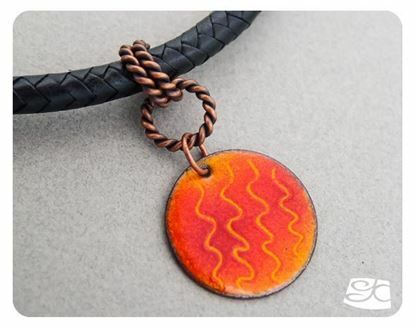 Enamel pendant & copper bail leather cord. 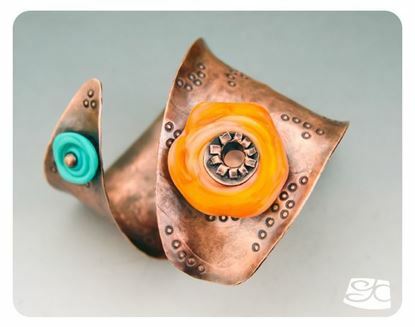 Handmade sterling silver cuff with foldformed tab-set copper cabochon. 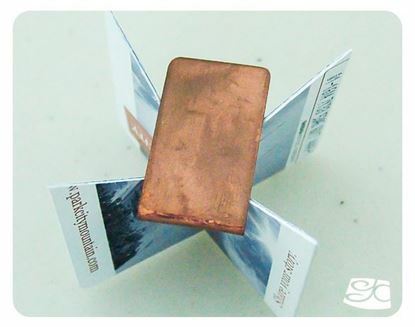 Foldforming is a thecnique that imparts a lot of strong texture to a piece of metal. Combine this with some stamping and colored patinas and the resulting surfaces are very unique. 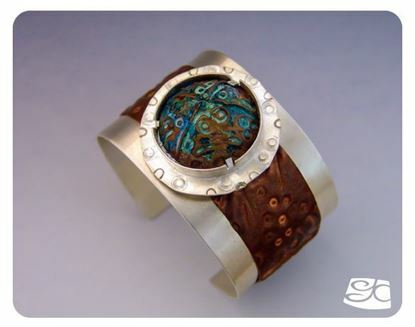 This sterling silver cuff has a foldformed- stamped cabochon and band. 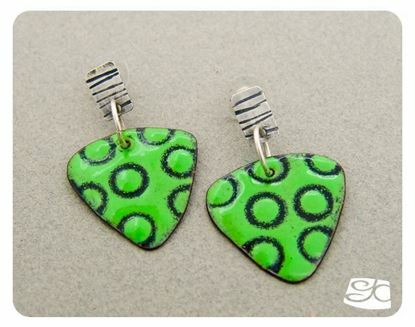 The cabochon was treated with 2 different patinas to obtain the blue-green pigmentation. The foldformed copper band on the cuff was left untreated, to attain a natural aged patina. Want to try something new? foldforming ,a patina , riveting, it all can be done in a smaller format. 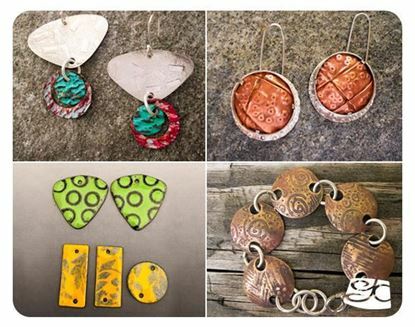 A pair of earrings, a ring, a charm or small link element for a bracelet, are ideal to try out new techniques. You can try many different things with a minimum use of material in a short time. If you like the way your experiment came out, use it. If you don’t like the way your sample came out, put it away for another day when inspiration strikes and you can use it in a completely new way. Now try your newly acquired skill on multiple small pieces for a bracelet or go for a bigger format, try making a pendant. This is a FREE PDF file for instant downloading. Stainless Steel trivets are commonly used in enameling and can also be used for ammonia fuming, but the steel will be affected by the fumes and will corrode slowly. Plastic is a non-reactive material perfect to use with ammonia fumes. You can make your own fuming trivets out of plastic, using old credit card, plastic gift cards or hotel room key cards. Template included. This is a PDF file for instant downloading. This is a FREE PDF file for instant downloading. The Moretti family introduced the use of copper mandrels as a “cost effective “production method of Venetian glass beads in 1920. 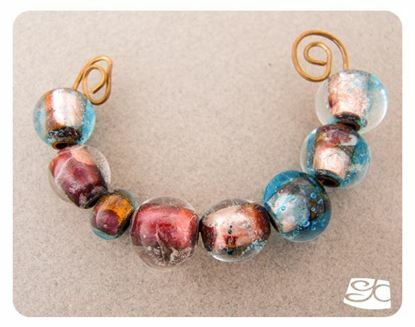 The beads were made directly over copper mandrels that were dissolved in nitric acid after annealing. The steel mandrel & bead release combo was retaken when environmental laws made more expensive the use and disposal of copper and nitric acid. So using Copper as a core for lampwork glass is not new. This mini tutorial is about the reaction of the bare copper to the flame and its effect on clear glass. You can get two very different effects, a deep dark red or swirls of aqua blue and bubbles floating in the clear over a bright copper surface. This is a FREE PDF file for instant downloading. 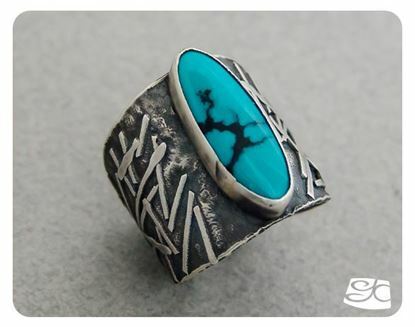 Number 2-Handmade one-of-a-kind sterling silver and turquoise saddle ring, size 11. The body of the ring is textured with a fused silver pattern of tiny sticks. The pattern is different in every ring. The ring band is 28mm (1 1/16”) at its widest. 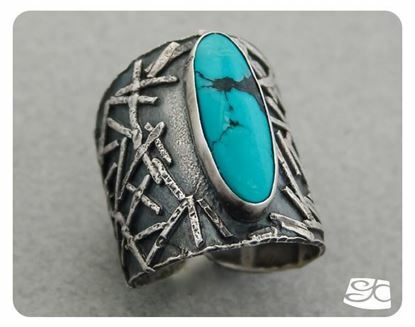 The long oval turquoise is a perfect centerpiece for this wide band ring. The ring is a very comfortable size 11. Thanks to its open back design, it can be slightly adjusted to a bigger size. Number 1	Handmade one-of-a-kind sterling silver and turquoise saddle ring, size 10. The body of the ring is textured with a fused silver pattern of tiny sticks. The pattern is different in every ring. The ring band is 23mm (7/8”) at its widest. The long oval turquoise is a perfect centerpiece for this wide band ring. The ring is a very comfortable size 10. Thanks to its open back design, it can be slightly adjusted to a bigger size. 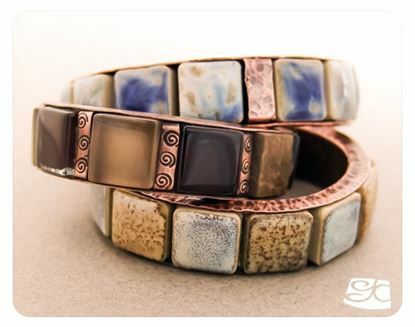 This cuff bracelet was inspired by the inlay stone cuff bracelets made by the Native American Zuni tribe from the New Mexico area. The Zuni were lapidary masters. They did stone inlay on shell bases and later on in silver. Inlay consists in bringing together multiple colored stones to form a design or pattern. There are three major types of inlay: channel, mosaic or “stone to stone” inlay, cobblestone or raised inlay and chip.The tutorial is an instant downloading PDF file, it has 10 pages, 24 photos, a life size template of all the components and plenty of tips! It comes with a Bonus Mini Tutorial to make your own mandrel. For beginner skill students. Tabs are small fingers of metal, cut into a jewelry piece that lets us attach objects that we don’t want to pierce or expose to heat. In other words, it is a “cold connection”. This project is a different take from the regular tabs. The tutorial is an instant downloading PDF file, it has 9 pages, 24 photos, a life size template of all the components and plenty of tips! It comes with a Bonus variant. For beginner skill students. 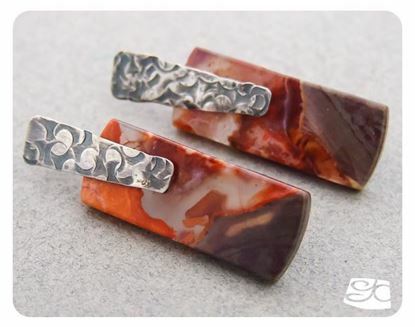 Copyright © 2019 GISELA KATI - DIY JEWELRY TUTORIALS. All rights reserved.